Kesner Mallette has worked for ADAPT Community Network for 11 years as a Direct Service Professional in the Day Programs, and the past three years at ADAPT’s 5030 Broadway location. He works with people who we support in Recreational Services; creating arts and crafts, painting, doing holiday projects, and helping out with day to day activities to keep our individuals safe and comfortable. Last summer Kesner noticed that some wheelchairs could use some spiffing up. 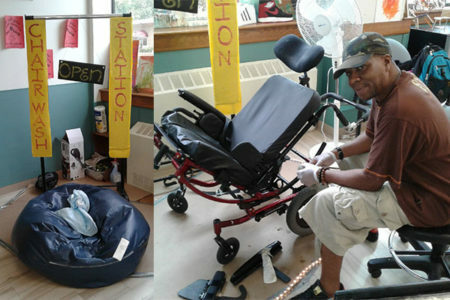 So, to help out, he put together a washing station to clean and lubricate wheelchairs for free for anyone who attends the 5030 Broadway Day Program. He has had steady customers ever since, who stop by to get their chairs cleaned or oiled and are thankful for his extra help. One individual who is non-verbal was particularly happy as communicating for her is not as easy as for someone else who needs help with their transportation equipment. “During busing I noticed that some individuals could use a little help with their wheelchairs. Making someone feel good about their means of transportation – like washing a car – is very rewarding. I really enjoy what I do,” said Kesner.